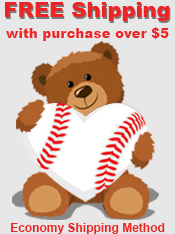 Add a Los Angeles Angels theme to a Baseball Rose gift, greeting card, or scrapbook page. 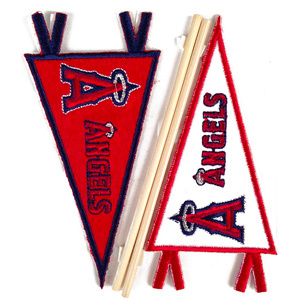 Los Angeles Angels MLB Embroidered Pennant Stickers are officially licensed by MLB and include 2 miniature one-sided pennants with wooden dowels. Each pennant measures 4" x 2" and the wooden dowels are 4 1/4" long. The entire back side of the pennant is covered with a strong adhesive surface. Get them while they last! Los Angeles Angels Pennant Stickers have been discontinued by the manufacturer and we only have a limited quantity left. View the options selector above to see what teams we still have available.